GrubHub took a beating last month, but it's still up roughly 30% on the year. 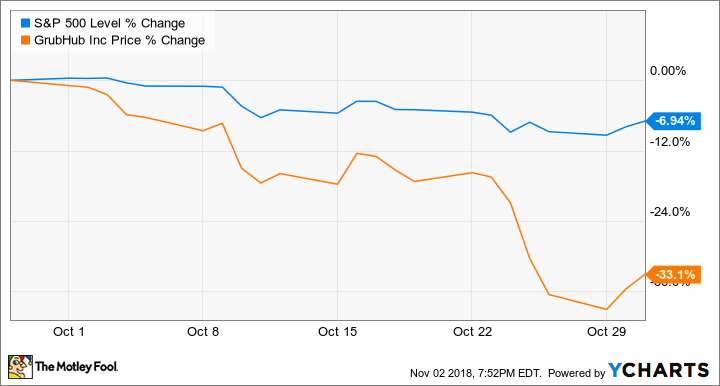 Shares of GrubHub (NYSE:GRUB) dipped 33.1% in October, according to data provided by S&P Global Market Intelligence. The online food-ordering company's stock saw big declines amid a pullback for the broader market last month and earnings guidance for the current quarter that investors found disappointing. GrubHub reported third-quarter results before the market opened on Oct. 25, delivering results for the period that actually came in ahead of average targets. Sales for the period rose 52% year over year to reach $247 million and top the average analyst estimate's call for revenue of $238.5 million. Earnings per share of $0.45 also topped the average analyst estimate target of per-share earnings of $0.41. However, the company's EBITDA guidance for the current quarter fell far short of expectations and triggered sell-offs late in the month. Analysts had expected GrubHub's fourth-quarter EBITDA to climb 30% year over year, but the company is actually guiding for EBITDA to decline between 12% and 30% compared to the prior-year period. The expected decline comes even as management anticipates sales for the period to be up between 38% and 43% year over year and is evidence of increased spending in order to stave off competition from Uber Eats, Door Dash, and other rivals. 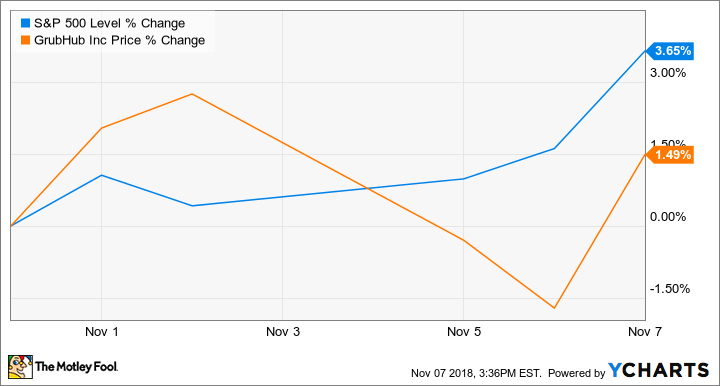 GrubHub stock has regained a bit of ground in November, trading up roughly 1.4% in the month so far but its recovery has lagged the broader-market's rebound. Shares still are up roughly 30% year to date, even after last month's sell-off, and trade at roughly 53 times this year's expected earnings and 8.5 times expected sales. That's a growth-dependent valuation and suggests that the stock could see more steep declines if market volatility continues or spending increases outpace sales gains for a prolonged stretch. GrubHub, however, also could benefit from its recent string of acquisitions and a growing market for online food ordering and delivery.